WASHINGTON, D.C. -- Before taking their long summer break, the Supreme Court justices are poised to act on the Trump administration's travel ban and a separation of church and state dispute involving a Missouri church playground. But something could overshadow rulings in those high-profile cases: If Justice Anthony Kennedy were to use the court's last public session on Monday to announce his retirement. Kennedy has given no public sign that he would step down this year and give President Donald Trump his second high court pick in the first months of his administration. Kennedy's departure would allow conservatives to take firm control of the court. But Kennedy turns 81 next month and has been on the court for nearly 30 years. Several of his former law clerks have said they think he is contemplating stepping down in the next year or so. Kennedy did not address the retirement rumors when he and his clerks gathered over the weekend for a reunion, according to three clerks who were there. The decision to push up the reunion by a year helped spark talk he might be leaving the court. The justices on Monday were expected to decide the case of Trinity Lutheran Church of Columbia, Missouri, which was excluded from a state grant program to pay for soft surfaces on playgrounds run by not-for-profit groups. The case was being closely watched by advocates of school vouchers, who hope the court will make it easier to use state money to pay for private, religious schooling in states that now prohibit it. Also expected in the next few days, though there's no deadline by which the court must decide, was a ruling on whether to allow the administration to immediately enforce a 90-day ban on visitors from six mostly Muslim countries. Before the Supreme Court justices begin their long summer break, they're poised to act on the Trump administration's travel ban and a separation of church and state dispute involving a Missouri church playground. Kennedy has given no public sign that he would step down this year, but he turns 81 next month and has been on the court for nearly 30 years. 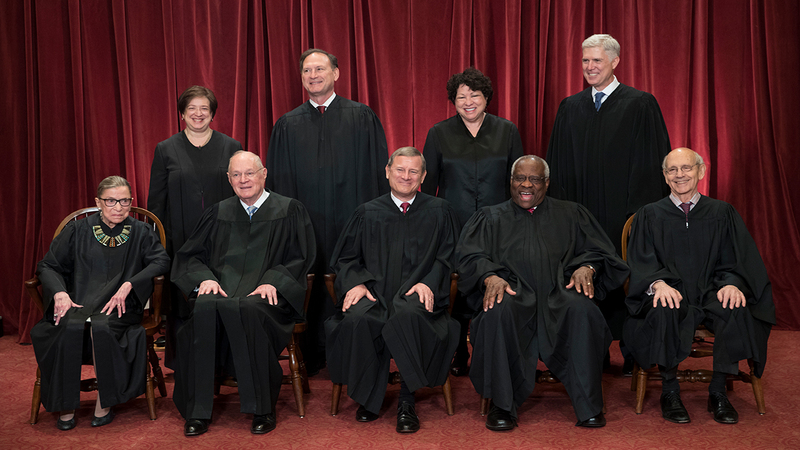 Kennedy's departure would allow conservatives to take firm control of the court. Meanwhile, the court is considering whether to allow the administration to immediately enforce a 90-day ban on visitors from six mostly Muslim countries.